Margrit Kennedy (1939-2013) was a German architect with a Masters Degree in Urban and Regional Planning and a Ph.D. in Public and International Affairs. 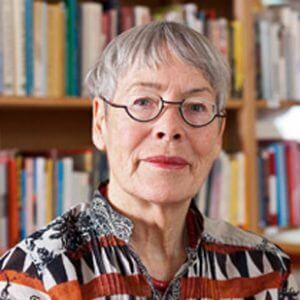 The author of books, articles, and reports for UNESCO and OECD on community school planning and building, her work on women and architecture, urban ecology, permaculture, money, land, and tax systems is recognized internationally. She also practiced architecture and urban planning in Brazil, Nigeria, Scotland, the United States, and Germany. In 1985 she moved to the eco-village of Lebensgarten in Steyerberg, Lower Saxony. From 1991 to 2002 she was a professor for Ecological Building Technologies in the Department of Architecture at the University of Hannover. Kennedy’s work on ecological architecture led her to the discovery that it is virtually impossible to carry out sound ecological concepts on the scale required today without fundamentally altering the present money system or creating new complementary currencies. Together with Bernard Lietaer she received the Swedish award “Utstickarpris” for their work on the monetary system. As a consultant, she helped to initiate numerous sustainable regional money systems in Germany, Austria, and several other countries. Starting in 1988 she and her husband, Prof. Declan Kennedy, conducted fourteen international workshops and conferences dealing with the different aspects of monetary reform. She continued to lecture widely until the year of her death. Her books include Interest and Inflation-Free Money: Creating an Exchange Medium That Works for Everybody and Protects the Earth, first published in 1987 and translated into twenty languages; Regional Currencies: A New Path to Sustainable Abundance (with Bernard Lietaer, 2005); Occupy Money: Creating an Economy Where Everybody Wins (2011); and People Money: The Promise of Regional Currencies (with Bernard Lietaer and John Rogers, 2012).